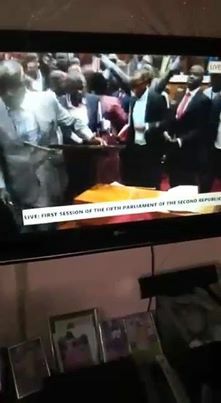 Last week’s disgraceful scenes watched by millions across the world, which took place in the parliament of Sierra Leone, have not only brought shame to the country, but called into serious question the political motive and strategy of the opposition APC. Is their intention to render Sierra Leone ungovernable and cripple the elected government of president Julius Maada Bio? If this is true, then last weekend’s talks held in Freetown by representatives of the Economic Community of West African States (ECOWAS) and the United Nations, to bring the leadership of both the ruling SLPP and the opposition APC together to find a peaceful solution to the crisis, could be futile. Opposition APC MPs are refusing to return to parliament, after many of them were forcefully removed from parliament by the police to stop their unprecedented violent and disruptive behaviour. But the ECOWAS and UN delegation are hopeful that after last weekend’s talks with all sides, common sense and the rule of law would prevail. The opposition APC are calling for High Court injunctions imposed on 16 of their members last week to be lifted before they can return to parliament. But the ruling SLPP are insisting that this has nothing to do with the SLPP, and that the opposition APC must go to the High Court to argue its case and prove itself innocent of all charges relating to electoral malpractice, rather than stain the sanctity of parliament and disrupt its smooth running. It is not clear whether the 52 members of the opposition APC will this week return to parliament, leaving their 16 injuncted members to address their legality at the High Court. This is the statement published by the ECOWAS and UN today (Photo: ECOWAS and UN meeting clerk of parliament). “A Joint High-Level Delegation, comprising the President of the Commission of the Economic Community of West African Countries (ECOWAS), Mr. Jean Claude Kassi Brou, and the Special Representative of United Nations Secretary-General for West Africa and the Sahel, Mr. Mohamed Ibn Chambas, today concluded a four-day visit to Freetown. “The visit was aimed at helping the return of normalcy in the Parliament following the unfortunate incident of 25 April 2018. “During the visit, the Delegation held wide consultations with former President Ernest Bai Koroma, the Speaker, Clerk and leadership of Parliament from the ruling and opposition parties, the Chair of the Governance Transition Team, religious leaders, members of civil society organizations, members of the Diplomatic Corps, and the United Nations Country Team. “The Delegation was also received in audience by His Excellency President Brig. (Rtd) Julius Maada Bio, who was briefed on the discussions held with national stakeholders. The Delegation expressed appreciation for his commitment to a peaceful transition and to pursue Sierra Leone’s goal of sustained socio-economic development. “With all interlocutors, the Delegation had fruitful consultations on current political developments and was pleased to note the commitment of all stakeholders towards peace, stability, and development. “The Delegation strongly recommended the establishment of effective channels and mechanisms of dialogue to resolve political differences. “In view of the urgent need to address the socioeconomic challenges the country is currently experiencing, the Delegation strongly urged the political leadership to desist from any action that could undermine state institutions, democratic governance, social cohesion, national unity, peace and stability. “Similarly, the Delegation encourages the Judiciary to ensure prompt, fair, independent and timely adjudication of all grievances and pending petitions regarding the recently concluded electoral process. The APC opposition party is poised at disrupting the country’s democratic life. Does the APC really want a peaceful country? After losing the general elections, they are now trying to make the parliament ungovernable, so that the country cannot be governed. The APC party never thought they were going to lose the elections. Now, they are applying the 99 tactics to disrupt the country. Truly, nobody would argue the fact that APC members did not accept defeat. This has been demonstrated by their actions in the Parliament, and with the behaviour of APC’s top hierarchy. They intended to obstruct the SLPP government completely and cripple them to zero. Out of greed and hatred for one another, self interest and lack of self value and with tyranny in themselves. They have stolen the nation’s wealth and invited criminals to loot our country’s resources. ENOUGH IS ENOUGH! Mr. Bangura you very well know that your opinion in this Newspaper is biased and fails to produce any element of truth. The injunction purported by the SLPP party does show a sign of greed and wickedness. It will not help the ruling SLPP party. It will only set the stage to political instability in the country. The March elections are over, it is time to move on and the two political parties to work as a team and help solve the most urgent problems affecting the masses. This is no time to take revenge against the outgoing government. The president elect has said it in London and I hope he means what he said in London. As Sierra Leoneans we must come together and put aside our differences and help the president move Sierra Leone forward. We are Sierra Leoneans and not APC or SLPP. Let us put the blame game in the dustbin.